I sat down and analysed my expenses for the first quarter of this year, and you get to see how I fared (by percentage). Mind, this is very much an accounting of my personal finances, which cannot be put to comparison with anyone else’s – not even Frédéric’s – and some of my expenses are calculated based on equal sharing with Frédéric (e.g. rent, electricity, internet at home, grocery) of which if I were to undertake on my own, they are bound to be different. 1. Essential expenses: allocate about 50% towards basic essentials of your life, namely the four sub-categories encompassing housing, transportation, utilities and groceries. 2. Financial priorities: at least 20% towards building a solid financial foundation, thus relates to future/retirement savings, debt repayments, deposit on house/apartment purchase, and the likes. 3. Lifestyle choices: a maximum of 30% towards discretionary spending, so everything else from mobile phone, internet, dining out, travel, cultural activities, charitable donations, beauty care, books etc. 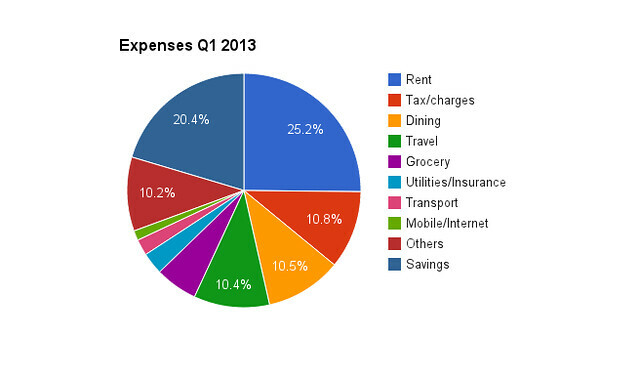 While this breakdown makes good sense, I think a couple of sub-categories of expenses are missing. The first being taxation, which is particularly relevant in France, as our take-home pay has not yet been deducted of the income tax. In addition, we also have residency tax (and if “lucky” enough to own, property tax) to take into account. Another sub-category would be unavoidable charges, such as banking fees and, for expats like me, visa renewal fees. I have therefore deemed these expenses as “obligatory essentials” and form part of the proportion of the “essential expenses”. By and large, it seems I have adhere quite well to the 50/20/30 rule without even knowing it beforehand. My actual expenditure ratio for Q1 is 47/20/33 after I combined the basic essentials and obligatory essentials together. 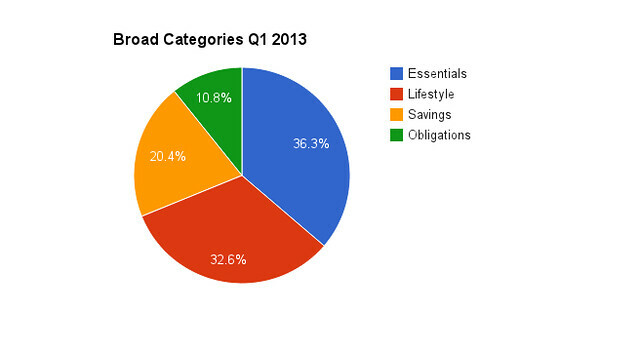 I did spend a little more in terms of lifestyle choices but it is not excessive either (by 3%). It’s good to know that I haven’t been living beyond my mean and that my financial priority has not being neglected. After all, this whole exercise in expenses tracking is to get myself ready for some upcoming changes, which also requires reasonable savings. However, I could, and should, work harder in improving the ratio of income going into savings and less on lifestyle choices. The essentials are more or less fixed. Rent takes out the biggest chunk of my monthly income, but it is still far below the 1/3 level that’s normally acceptable to get into the good book of any Parisian landlord. Taken into account the utilities (electricity, heating, water, waste management) and housing insurance, the total comes up to 28%. This doesn’t differ much from when I was living in Cité U where I paid nearly 30% of my salary for all the above including internet facility. In the current analysis, I (rightly?) consider internet facility a lifestyle choice. The next big chunk of expenses relate to taxation and charges. Here, I’ve included income tax (annual sum divided to get 3 months’ amount), taxe d’habitation (idem), visa renewal costs (idem), and banking charges. My major vices that I cannot live without are food (well, dining out and all the other little treats like pastries and chocolates) and travel – very clearly shown here given I spent 10.5% and 10.4% respectively on them in the last three months. I notice my pastry spending shot up (1) in January thanks to my fixation on galette des rois, and (2) each time we have visitors, since I wanted to share my favourites with them. We actually haven’t been travelling much in Q1 but thanks to flight reservations for our upcoming trips to Ireland and Greece, the numbers added up accordingly. Between grocery, transportation, mobile phone and internet expenditure, these amounts are fairly constant as well. They total up to some 9%, of which the majority was spent on essentials (i.e. grocery and transportation). Last but not least, there are some other lifestyle expenses amounting to about 10% of my income too. The purchases under this sub-category include books, postage, shoes, presents (lots of presents actually), cultural activities (e.g. museum visits, participation in THATd’Or), skincare products, running costs of this blog (the domain and host renewal happened to fall in Q1), and charitable donations. So, is it expensive to live in Paris? Yes and no. Yes, mainly because everyone can go as extravagantly as they possibly wish. No, mainly because with a little finance savvy, you can still set aside some nest egg while living comfortably. My current essential expenditure sits at around 47%. There is a possibility to lower this further, say, if Frédéric and I choose to move to a smaller apartment or to a cheaper neighbourhood. However, when we consider the convenience of our current location (it is smack in between both of our workplaces and within walking distance to boot! ), the various amenities offered near us, the safety factor and the efficient maintenance of our buildings, it’s going to take quite a lot to pull us away from where we are right now. A small amount of saving in rent may well end up just about paying the agency fee, which then makes false economy until at least a couple of years has passed. These are not meant for everyone, and let’s face it, we all have different priorities. For example, I’m not a fan of shopping so I really don’t buy much clothes/shoes/bags – do you know just how much savings I’m making on these items alone? 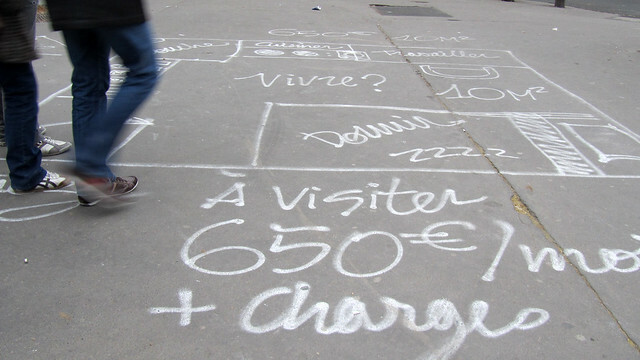 Housing: It is a known fact that the rental market in Paris is crazy. Trying to strike the right balance between price, location and size is not easy, but can be done. It is less intimidating to search for something outside of August/September period. We searched for ours in November and found one without queuing with 50 others, fighting to deposit our dossiers. If you can find a place to rent without involving an agency, there’s about one month rent (if not more) of saving to be made. Grocery: Buy your vegetable, fruits and meat at the open markets as they are usually cheaper than the supermarkets (but do compare prices between stalls!). Alternatively, if it’s handy to head to main ethnic supermarkets/grocery stores, there are much on offer at lower prices too. Of course, never buy ethnic products in main supermarkets e.g. soya sauce and coconut milk cost 2-3 times more in Monoprix than in Tang Frères. Eating out: This is my “splurge” category and I’d rather pay a little more for better quality treats (or eat out less) than go too cheap. 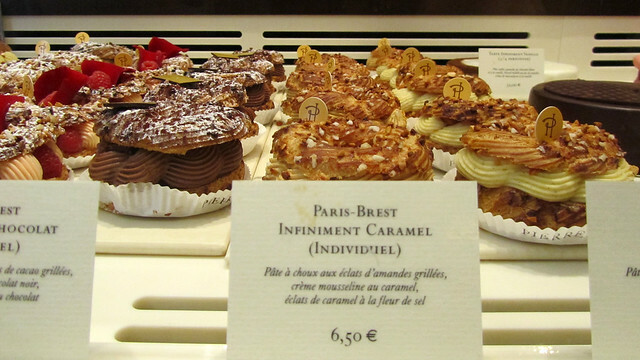 The quality point is even more obvious with pastry (e.g. if you want to know what the real fuss is with macarons, try comparing a piece from high-end pâtissier to one from nondescript chain of boulangerie, and you’ll know what I mean) and chocolate. When eating out, the lunch menu is usually more competitively priced and of good value in comparison to dinner menu. Otherwise, check out La Fourchette for discounts and special menu prices. However, I would say avoid the deals offered by Groupon or Living Social unless you know of the restaurant’s reputation – I’ve heard too many horror stories of overbooking (as the discount sites oversell the vouchers) and therefore voucher holders had much difficulty in actually using the vouchers before the expiry date. Transportation: Never buy single tickets for use in métro and buses but always get them in a carnet of 10. I’d even go as far as saying buy tickets for the airport in a carnet too (I do that with RER tickets for Paris-CDG). The tickets don’t expire. For regular passengers, Navigo zones 1-2 is handy and currently is even valid for the entire RATP network including the suburb during the weekends. Otherwise, frankly, a year of Velib’ subscription costs near to nothing, so get cycling! For anyone who travels a good bit around France on the TGV, get a reduction card; in many cases, it’ll pay back itself after a couple of return trips. Books: The membership to the public libraries is free (a small charge if you want to borrow items in the form of media and specialised items) and you are eligible to borrow from all the public libraries in Paris. Many even have good selections of foreign language books. Alternatively, keep an eye out on Circu’Livre for an opportunity to swap books for free. Second hand books are also available in various locations around the city and some can be very cheap to buy. Phone/internet: Shop around for the best package available, or discuss the possibility of changing provider (once you’re not tied to a specific contract) with your current provider thus to negotiate a better package price. With players like Free and Virgin Mobile on the market, the traditional providers such as Orange, Bouygues and SFR had got to adapt! Museums: There’s considerable number of municipal-managed museums that are free all year round, and there are many major museums that are free on first Sunday of the month as well as some evenings during late opening. For your favourite museums that you will go back over and over again, get a membership card. Certain museums have links with others, offering the members either free entry to associated museums, reduced ticket tariff, or even reduced price membership. Cinema: If you are a fan of the big screen, I cannot recommend enough the unlimited card offered by UGC/MK2 and Gaumont/Pathé that can be used in their respective network of cinemas as well as some independent ones. The monthly subscription costs about the price of two movies at a standard rate, so by getting a card, you’re capping your cinema-going expenses (provided you are not pop-corn buyer at each visit either!) regardless of how often you are at the cinema. Last year, Frédéric and I averaged about one movie per week, so that’s a lot of savings to be had. In general: Buy items (clothes, kitchen utensils etc) that last, even if they cost a little more to acquire, so in the long run you need not constantly replace them. 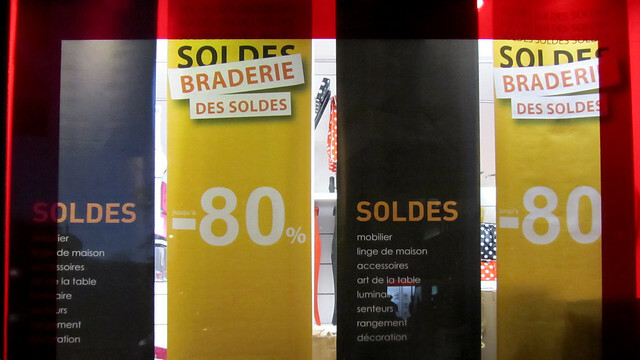 The sales periods (January, June/July) are also good time to look for bargains. Sites like vente-privée are worth checking out but be very careful with the pitfall of shopping for things that you don’t need! Really great post! I think this is something that so many people forget and the details of living abroad often become an afterthought once the novelty of the big move settles in. Great trips here! Totally did not know about the movie subscription! I need to check that out!